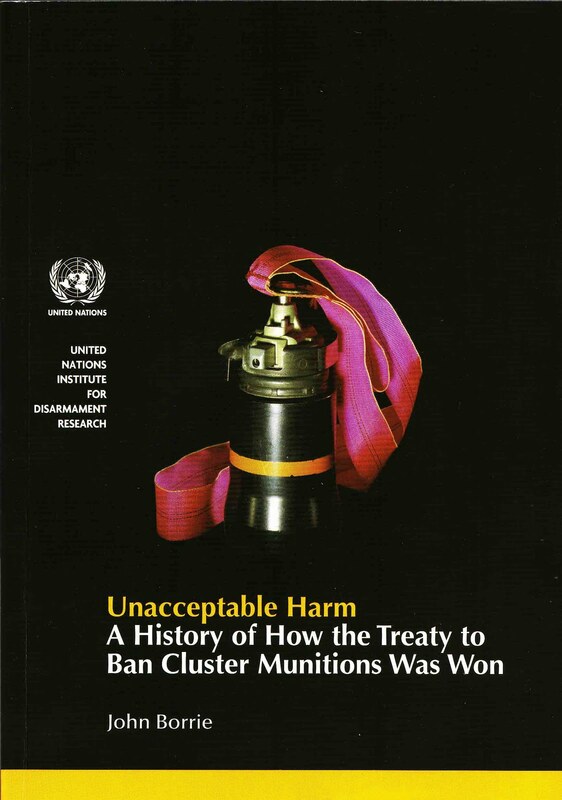 We have a bit of a news of our own: the history I’ve been working on for the last two years of international efforts to deal with the humanitarian impacts of another problematic weapon, cluster munitions, is now printed. The book is entitled Unacceptable Harm: A History of How the Treaty to Ban Cluster Munitions Was Won. The cover image (see above) is of a French F.1 ‘Ogre’ submunition, with the gracious permission of the French artist and photographer Raphael Dallaporta. There are also colour plates in the middle of the book, with some great images by the Norwegian photographer Werner Anderson and others. The book also has a foreword written by Dr. Eric Prokosch, one of the pioneer researchers on cluster munitions, and author of the classic book The Technology of Killing: A Military and Political History of Anti-Personnel Weapons (1995). Unacceptable Harm explains how the Convention on Cluster Munitions was achieved through the ‘Oslo process’, a partnership of governments, international organizations and civil society not unlike the one that resulted in the Anti-Personnel Mine Ban Convention in 1997. The book examines why it took the world so long to act on cluster munitions, why it eventually did, and what lessons banning cluster munitions might hold for future efforts on a pressing challenge of our time: protecting civilians from the effects of explosive weapons. (For further info on explosive weapons, see also Landmine Action's recent report). The book will initially be launched in Geneva on 11 December, to be followed by events in Oslo and elsewhere in early 2010. Stay tuned to the blog for further updates.